Classic dual overdrive. The original 1969 plug-in Muff Fuzz had just a touch of overdrive and sounded like a vintage amp with a slightly torn speaker. 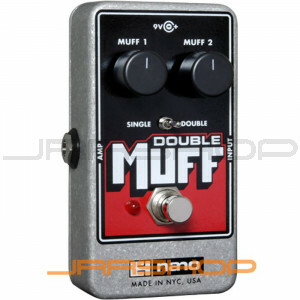 We paired two of these together in one box to create the Double Muff. Use just one Muff for a hint of milky distortion, or cascade the second Muff for over-the-top overdrive that turns the milk into cream. Two distortions in one! Now in a compact, rugged Nano-sized package.